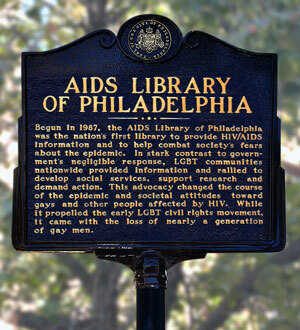 Founded in 1987 at the height of the epidemic, the AIDS Library of Philadelphia is the first and only public lending library in the world dedicated to HIV/AIDS information. Led by John Cunningham and Heshie Zinman, the library began as a community project to supply crucial educational resources to people stricken with the virus and to help combat fear and stigma. Today the library also serves health care providers, legal professionals and AIDS organizations. In stark contrast to the U.S. government’s negligible response to the epidemic, LGBT communities nationwide provided information and rallied to develop social services, support research, provide empowerment and demand action. This advocacy changed the course of the epidemic and attitudes toward gays and other affected people. Although the AIDS epidemic propelled the early LGBT civil rights movement, it came with the loss of nearly a generation of gay men.